"I was hoping for 20 (years) but realistically I thought maybe 10, but hey, he's incarcerated, he can't hurt anybody," says victim's father. Cardinal George Pell has been sentenced by an Australian court to jail for six years for the sexual abuse of two choirboys in the 1990s for which he was convicted in December 2018. In handing down the sentence on Wednesday, County Court Chief Judge Peter Kidd characterised Pell’s abuses as “grave” saying they’d had a “significant and long-lasting impact” on the person known in the case only as J (to protect his identity) upon whose testimony the conviction relied. “The acts were sexually graphic, both victims were visibly and audibly distressed during the offending,” Chief Judge Kidd told the court. Of the other victim in the case, known as R and who died in 2014 from a heroin overdose, the chief judge said Pell’s actions were certain to have affected him. Following the sentencing, which was broadcast live on ABC television, R’s father said he was unsatisfied with Pell’s punishment of six years. “It’s not going to bring my son back,” he said, according to the ABC. “I felt like my son’s life was wasted, R’s father added. Cardinal George Pell, who was the third highest ranking Catholic in the world, was sentenced to six years in jail for the molestation of the two boys with a minimum of three years and eight months to be served before being eligible for parole. 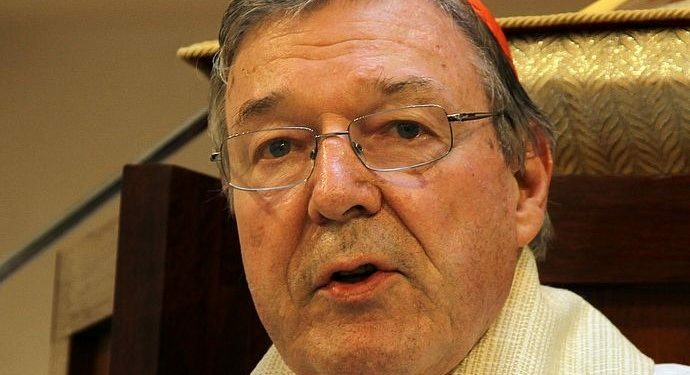 Pell had been convicted by a Victorian court in December 2018 of the offence, however a gag order preventing media coverage of the case in Australia was only lifted in February this year. The cardinal maintains his innocence and a hearing for an appeal is scheduled for June.